May buy 1 for yourself and 1 additional as a gift. May redeem 1 per person. Shows start in February. Must use entire value in 1 visit. Valid only for option purchased. Reservations required and showtimes subject to availability. Optional actors' tips not included, but appreciated. Valid through: Sep 1, 2016. See the terms that apply to all deals. You are cordially invite to come celebrate the wedding of Drake Mallard and Mallory McGillicuty. However, with millions of dollars on the line, love triangles, revenge, and betrayal, something bad is bound to happen! Can you solve the mystery? Castle of Chaos was originally a non-scary attraction, but once it developed into a true haunted house, Mystery Theatre was created to fill the "interactive theatre" gap that was left. 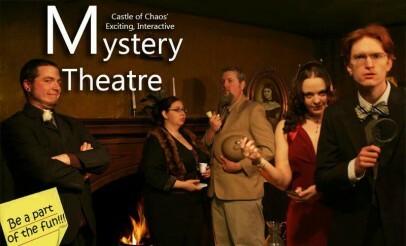 Mystery Theatre is more like a game than a traditional theater because you'll be part of what's happening! You can explore the crime scene, question the characters, and find out for yourself who is guilty.